“I already ate, babe.” I’d had cheese, an orange, apple butter, and some really good rum apple bread. I didn’t tell him any of this. He didn’t need to know the details. Of course, there are days when I don’t want a smorgasboard first thing in the morning. I want something lighter, and that’s where these tacos come in. They actually originated as a late night snack, but they were so good that I had them again the next morning. They make a wonderful lighter breakfast. Enough calories to get you going, but not so many that you need to turn around and take a nap. This recipe is for only two tacos, but totally make more if you please. I wasn’t going to share these because this is such a simple recipe. But I’m realizing that people like simple recipes, they like simple recipes involving avocado, and they really really like it when said recipes can be eaten in the morning. That’s why everyone’s obsessed with avocado toast, right? Toast the tortillas till warm but still pliable. Smash the avocado on them, then add the mint. sprinkle the arils, lemon juice, and salt over top. Enjoy. Ooh, I love this idea. I’m a big fan ov avocado toast but I try not to eat too much toast (sometimes). Tortillas are a great alternative. ALSO adding pomegranate is awesome! I love how fresh these tacos are! 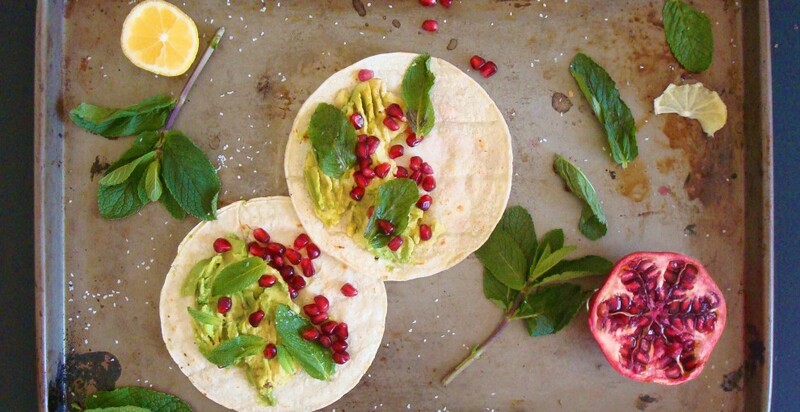 I would have never thought of putting mint, avocado and pomegranate together! This is such a unique combination I have never thought of but now it’s all I want! Haha thanks! Necessity is the mother of invention. err….Necessity is the mother of tacos?